In some respects, this isn’t surprising. While our community here at the NLSC has often placed a great deal of emphasis on the PC version due to modding, the truth is that most basketball gamers are on console. With the PC’s much smaller userbase, the number of people to play with and against online naturally pales in comparison. This niche demographic within the basketball gaming community is further divided by relegating users to regional servers. It’s a move that’s done with the goal of optimising the online experience in mind, but it carries the downside of cutting gamers off from one another, particularly those of us outside of the US. For a lot of NBA 2K PC gamers, this needn’t be a problem. You don’t need to connect with anyone else to enjoy MyLEAGUE and MyGM, or the NBA in MyCAREER. If you’re not interested in 2K Pro-Am, The Playground, or the online multiplayer modes within MyTEAM, empty Neighborhoods and fruitless searches for online teammates and opponents probably won’t concern you for the most part. Indeed, it’s probably fair to say that a lot of PC gamers actively avoid the competitive online components of NBA 2K. With the amount of hackers bringing ridiculously OP monstrosities into The Playground, it’s not the ideal platform for good, clean competition. That in itself is a problem that 2K must address with the PC version. They have tried, of course, but hackers keep finding ways around the security measures. Despite the presence of those cheaters, however, there is still interest in playing online in the PC version. As demonstrated by the video I linked to, it is possible to find yourself on a server with many other gamers, but again, it’s far less likely for those of us who don’t live in the US. Furthermore, even if you are intent on sticking with the single player experiences entirely (or at least for the most part), there are aspects of the game that encourage and even require you to dabble with the online modes. I mentioned that it’s possible to ignore the online modes within MyTEAM, and that is true…provided that you don’t want to unlock the Auction House. That requires you to complete a single game in both Triple Threat Online and Unlimited, so even if you’re sticking with the single player modes, you’ll still need to play online to unlock a basic function. It does serve a purpose, promoting game modes while making it difficult for less scrupulous gamers to crash the market, but ultimately amounts to gatekeeping. It was worse at launch as you originally had to win those games as well, but it can still be tough on PC where simply getting a game is often easier said than done. It’s a similar story with MyCAREER. 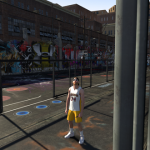 Finding yourself in empty Neighborhoods may not seem like a big deal if you’re happy just playing through an NBA career, but even if you’re not that interested in 2K Pro-Am or The Playground, there are times when you may feel like giving them a try. For gamers who like to go after Achievements and Trophies, there are a few that are linked to online modes, namely Rattle On (play in the Cages), Get Your Feet Wet (play a Jordan Rec Center game), The 5 D’s (win a round of dodgeball), and On the Rise (win as a Pro-level or higher Pro-Am team). When you can’t find any other gamers, those Achievements remain out of reach. Even if you don’t care about Steam Achievements, there are incentives to play the connected online modes in MyCAREER. The Daily Goal with its usual prize of 3000 VC is a helpful way of boosting your balance, which all helps when you’re grinding up your player’s attributes. 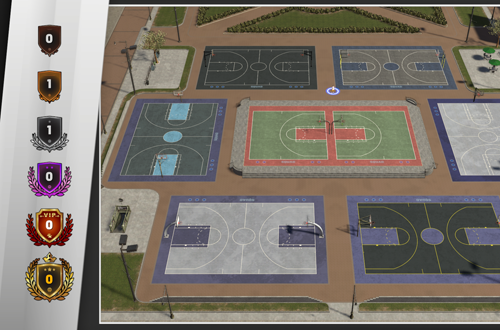 While many of these random goals are attainable in NBA games, such as making five dunks or hitting a limitless three, sometimes the goal will be playing in the Cages, or completing five 1v1 games while the event is running in The Neighborhood. Completing and/or winning five games within the span of 24 hours can be achieved more easily with the quicker games of The Playground. If nothing else, these online modes should at the very least be feasible options. 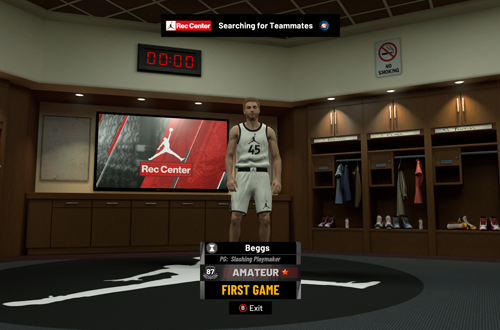 It is admittedly tough for NBA 2K to address the issue worldwide, but there are a couple of things they could try, and I would suggest that they’d be worthwhile. The first is to strengthen the anti-cheating measures to make online play in NBA 2K PC far more welcoming and appealing. The second would be to open up play between regions, or allow gamers the option to search for games in multiple reasons, a la Rocket League. I’d also suggest avoiding having Trophies/Achievements and unlockable functionality tied to the online modes, but unfortunately that’s probably wishful thinking. 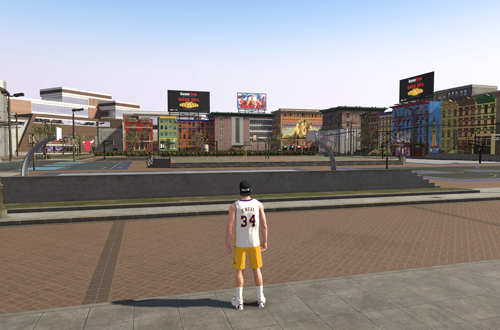 There are a couple of reasons that I’d like to see NBA 2K PC bustling with activity online. The first is that the game has some very fun online modes, and it would be great if more PC gamers could get involved with them. The second is that I’d hate to see the PC version become a stripped down release due to the lack of online activity, or worse, the game not come out on PC at all. The userbase may be smaller on PC, but glancing at the stats over in the Steam Database, there’s usually between 10,000 and 20,000 gamers online at a time, of the estimated 200,000-500,000 who own it. Allow connections between regions, and we should see fewer empty Neighborhoods. Hopefully, it’s a situation that can be resolved in NBA 2K20 and beyond. For my part, I’m mostly satisfied with using the PS4 version to play online with friends and using the PC version for the single player experiences, but whether it’s chasing the Steam Achievements, stocking up on VC, or unlocking MyTEAM functions quickly and efficiently, I’d still like to see those online features and modes become more viable on PC. There may be serenity in those empty Neighborhoods, but it’s letting some great features go to waste. A primarily international issue on PC may not be a high priority, but addressing it would stir up engagement within a smaller, yet enthusiastic userbase.